What is it? – How to Raise a Dragon is a unique retro-looking platforming adventure game of sorts where you’ll not only play the role of a dragon from the time it hatches until adulthood, and determine its ultimate fate. Who made it? – The game was created by Gregory Weir, the talented developer behind other great adventure games like The Majesty of Colors and Bars of Black and White. How does it play? – How to Raise a Dragon is a strange and unique beast. You begin the game as a small dragon hatchling, navigating your environment in search of food. 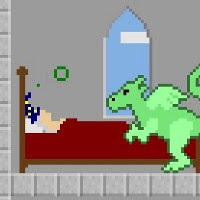 The food you consume as a youngster will determine the color of your dragon, as well as predispose him to the type of dragon-breath he’ll be able to use later in life. The rest of the game consists of two more stages in the dragon’s life, plus a “special” level, which I won’t ruin for you here. The things your dragon eats and the actions it takes will all impact how the story progresses. Presentation – The graphics are lovingly rendered in old-school 8-bit style, and Weir’s deft use of chunky pixels is charmingly effective. Storybook panels pop-up in a tutorial-like way to provide various information about dragon evolution, and the sound effects and minimal music are crisp and effective. Positives – The challenge (and reward) of How to Raise a Dragon is not in getting to the end of the game, but rather how you get there. Each level has a relatively large number of choices and actions that will influence later decisions, including which ending you receive. Without knowing exactly how many possible endings there are, I can say that played through the game four times prior to writing this review; and each story played out differently, depending on various decisions I made. Each time you complete the game, you replay any stage, tweaking your dragon’s attributes (which will need to be unlocked via prior playthoughs), and attempting different story-outcomes. Very cool stuff. Negatives – If the whole “retro, 8-bit, pixilated” look really turns you off, you might have a tough time getting into this one. The game also doesn’t pack much of a traditional challenge (unless you’re trying to achieve a specific outcome). Why you should play it – How to Raise a Dragon is worth playing through at least a couple of times to see at least a couple of different endings, but may keep you engaged for much longer. It’s simple to play, employs a unique concept, and is highly replayable. Now if you’ll excuse me, I hear the sound of an egg hatching.